Tennis is one of the most frequently bet-upon sports in the world, and its year-round competition and variety of formats ensures there’s always something new and interesting to be betting on. It can also be somewhat intimidating, as there are countless tennis betting sites to choose from, and not all of them are of high quality. It’s important to know what to look for so you can select the tennis betting site that suits your needs the best. 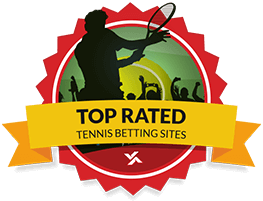 Below is our list of the best and safest tennis betting sites available. These sites have been in the business for years and have a proven record of paying out winners in a reliable and timely fashion. They also offer competitive odds and are resolutely user-friendly. If you’re looking to start betting on tennis, there are just a few decisions you have to make. Choosing a tennis betting site and a deposit method depends on what you need and what you’re looking for, so let’s walk through how to make those choices. Each deposit method has its own respective strengths and weaknesses, so make sure you do your homework on which deposit method works best for you. Additionally, the time it takes for a deposit to reach your sportsbook varies from method to method. Additionally, once you land on your preferred funding source, ensure that your tennis betting site actually accepts that method. You’ll be able to find this information easily in the “cashier” or “portion” of whichever tennis betting site you end up depositing with. Are Deposit Bonuses Right for You? Deposit bonuses can make or break your tennis betting experience. If used correctly, they’re an exciting way to supplement your initial deposit at a tennis betting site. Many sites will offer you bonuses on your first deposit, but those bonuses will often come with strict terms and conditions. Bonuses could thus increase your bankroll from the start or handcuff you to a sportsbook with rollover requirements. If you’re considering taking a deposit bonus, make sure to check the terms and conditions before you make your deposit, so that you know just what you’re getting into. However, if utilized correctly, bonuses are a great way to supplement your tennis betting experience. In our experience, no one has ever been allergic to free money before. Does Live Tennis Betting Interest You? Some people love the options live betting gives them, and tennis lends itself particularly well to the live betting format. Bettors cans make their decision between sets, after a changeover, or even during a particularly fun tiebreak. Live betting lets you make most of the same bets on a tennis match that you could have made before the match started, but while it’s still in play. Odds will fluctuate in response to the score, but since tennis is a cumulative sport (and running up the score in one set doesn’t really change either player’s path to victory) they should remain pretty stable. Live betting is difficult to design, implement and maintain, so some betting sites don’t offer live tennis betting options at all. Every one of the betting sites listed above offers some live betting options, but check and see if they have all the tennis betting features within their live betting platform that you’re looking for before you make a deposit. If you’re away from your computer, betting can be a pain. Most betting sites will let you login to your account and makes bets from a mobile browser or app, but that can be a glitchy, clunky ordeal. Fortunately, the tennis betting sites above are equipped with a user interface that’s optimized for mobile and runs smoothly. This is essential if you want to make quick bets on odds before they disappear. Further, mobile betting lets you make bets for everywhere and anywhere you can get a signal, which gives you more time to think about which lines you’re laying cash on. What Kind of Odds and Bets are Available on Tennis at Your Betting Site? Almost all tennis betting sites will offer spread, moneyline, futures, totals, and prop odds on upcoming Association of Tennis Professionals (ATP) matches. If those terms sound confusing, check out our betting 101 guides. These bets are pretty standard fare for tennis betting, and we’re completely confident that every site listed above will offer them on the vast majority of tennis matches. While that’s already a lot of matches to bet on, and a lot of possible bets to make, you might be looking for something different. If you want to bet on Women’s Tennis Association (WTA) or International Tennis Federation (ITF) matches, grand slam futures, or non-tour events, make sure the tennis betting site you choose offers those odds. These are definitely niche lines, so if you’re interested in them, be sure to double check that your prospective tennis betting site offers them. All online sportsbooks make their lines public to view (but of course not to bet on), so this won’t be an issue. It’s hard to imagine anything more frustrating than wanting to make a bet and finding that your sportsbook doesn’t offer those odds.